23% of UK employees either disagree or strongly disagree that management contribute to a positive environment. Let that sink in. Almost a quarter of the people who keep our businesses ticking over have fundamental issues with those in charge. While just 41% of UK employees feel aligned with their organisations’ goals, only 13% said they didn’t want to become more aligned. Although it’s disheartening to find that so few employees have bought into their organisations’ visions, the overwhelming majority want this to change. It’s HR’s duty to enable this alignment. 36% of the UK workforce said they’re likely to leave their jobs within one year. Imagine the amount of time and resources that would go into recruiting and retraining over a third of your entire organisation. 59% of employees said a personalised benefits package would influence their decision to remain at their company. Now forget the above calculation: there are many ways to retain talent without exceeding budgets. The link between employee engagement and business performance is now irrefutable, but the cultural norm of motivating workers beyond their pay check is a relatively recent development. When not so long ago the lion’s share of the job market involved manual labour, there was less – if any – call for organisational alignment or progressive managerial relations. However in today’s technology-driven world, the average role demands a higher level of psychological wellbeing in order to be performed to a decent standard. Without labouring the ‘realness’ or psychological evidence in favour of the concept, the results of this study highlight that the financial imperative for employee engagement is twofold: firstly, for improved business performance; and secondly for the retention of talent and subsequent saving on recruitment and retraining costs. Based on the first-hand experiences of hundreds of demographically diverse employees, the findings of this report highlight the need for employee engagement, and shed light on how HR managers can effectively lead the change. The common causes of frustration among employees and how HR managers can address them. The link between organisational alignment and employee engagement, and how HR managers can influence both. The devastating financial cost of recruitment and retraining, and how HR managers can avoid both. Many modern roles are by nature highly stressful and procedurally complex. But whether it involves interrogating data in spreadsheets or compiling tax forms for overseas shoppers, our research suggests that core duties are being exacerbated by a host of factors that could be addressed without too much hardship on the part of either employee or employer. One in five (20%) of UK employees feel undervalued at work, while a further 7% feel highly undervalued. It’s clear that employers are collectively struggling in some areas more than others – the trouble is identifying which are most pressing. So, to dig deeper, this research honed in on two key areas: frustrations employees have towards the workplace as a whole, and also towards management specifically. One of the most obvious solutions to work-related frustrations is open dialogue; to candidly discuss issues as they arise. Indeed over a third (35%) of UK employees said the biggest frustration they face at work is a lack of communication – a factor that contributes more stress than poor leadership (32%) and a lack of recognition for time and work invested (32%). Surprisingly, wage-related issues only rank fourth (30%) and a lack of career development opportunities rank fifth (26%). What frustrates you about your current role? The employee-manager relationship will always be prone to stresses and strains, but the way in which these problems are prepared for and addressed is rapidly changing – most universities now have organisational management somewhere on the syllabus, while you’d be hard-pressed to find a large company that hasn’t undertaken some level of management training. Perhaps that’s why it’s so surprising to find that almost a quarter (23%) of UK employees disagree or strongly disagree that their management team contributes to a positive work environment, while a further 29% are on the fence. Therefore less than half (48%) of employees believe managers are a force for positivity. In a line, this suggests organisations desperately need to do more to address the perceived ‘us and them’ dichotomy among workers. Definitions of employee engagement abound, but the three consistent characteristics include realising employee potential, sharing organisational goals, and promoting employee wellbeing. It’s therefore concerning to find that just 43% of the UK workforce identify as being enthusiastic about their current role. Clearly organisations are making fundamental errors when it comes to engaging the remaining 57%, the results of this study point towards two key areas that are driving this disconnect: a lack of alignment with company goals and an absence of recognition for loyalty. Goal alignment strengthens leadership and creates flexibility; with a mobilised team working towards the shared objectives, organisations can execute strategy faster and with more agility. Therefore it’s disheartening to find that only 41% of UK employees feel aligned with their organisation’s goals – but it’s important to look deeper. Our next question asked whether respondents would like to feel more aligned to their organisations’ goals – just 13% disagreed. Clearly there’s a disconnect: while the number of employees who currently feel aligned with their business’ goals is relatively small, almost all would like to be more aligned. Therefore it isn’t that employees are against their employers, it’s that employers aren’t doing enough to help their employees get on board with the common goal. Yet again, communication is key. Organisations can address the misalignment explored in the previous section by promoting employee wellbeing from the offset. The first step to achieving this is to figure out exactly how employees want to be recognised and rewarded, so we put the question to our respondents. Of course indiscriminate pay increases are rarely an economically viable solution, so it’ll be welcome news to HR managers that 66% of employees agreed that regular personalised benefits – such as cost-saving perks, free meals, and gym memberships – would be appreciated as recognition for their loyalty and personal investment. Which of the following would you appreciate as acknowledgment for your work? What’s more interesting – and a new angle for inspection – is that, should roles be reversed and employees become managers for the day, just 27% would increase pay to motivate their team. Some 22% said they would provide inspirational appraisals and 21% would introduce benefits and rewards. The Telegraph recently reported that recruitment and retraining costs the UK £4bn a year (roughly the same as 10% of the nation’s expenditure on defence), while Forbes estimates that organisations with engaged employees enjoy 6% higher net profit margins. So beyond organisational objectives and employee wellbeing, the final area this report covers is perhaps the most financially significant: retaining talent. Considering the Telegraph’s estimation, the state of disengagement among UK workers is bordering on epidemic. But how much of an effect do the aforementioned pain points and managerial conflicts actually have on employees? In terms of the levels of deflection suggested by our survey, the answer is unsettling. How likely are you to leave your company within one year from now? Unless unknown and radical external influences transform the nature of work, payment will usually take precedence – but that doesn’t mean it’s the only criteria. HR managers might be surprised to find how many other factors carry huge weight in the decision making process. Despite many compelling arguments against its very existence – or at least its practicality as a theory – work-life balance ranked as the most important driver of new employment after salary. 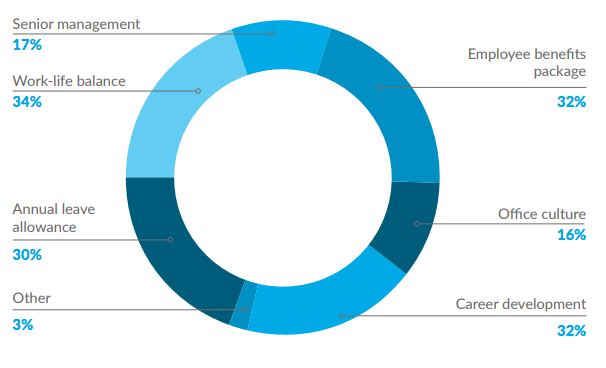 Employee benefits packages (32%), career development opportunities (32%), and an increase in annual leave (30%) closely follow as incentives to change work. What would attract you to move from your current position to a new one? When it comes to proactively retaining employees, a huge 59% said a personalised employee benefits package would either influence or highly influence their decision to remain at the company, while a further 15% are undecided. Clearly employees are willing to remain loyal to their employer – if they’re given reason. At Perkbox, we believe happy employees perform better and stick around for longer. To that end, we’ve created a platform that offers teams a wide range of rewards and recognition to help support that happier, more productive company culture.